In CARA’s early days, in the 1960s and 1970s, we had a series of research reports under the label “Town and Country” which documented the life of the Church in rural America. Two years ago, we showed how the population of rural and small town America is shrinking—even as many say they would prefer to live in that environment. Economic changes have drawn population out of rural communities. Some manufacturers have closed shop and shifted to overseas factories using cheaper labor. Many small farms have been eaten up by industrial agriculture and the creation of a new mode of food production, which often relies on a mobile work force that does not permanently reside in the communities where the work is done. Jobs increasingly are found in the cities and suburbs rather than in small towns and the countryside. Yet rural America still remains the home to many—including Catholics and their parishes. In our national surveys we know whether respondents live in a Metropolitan Statistical Area (MSA) or outside one of these. An MSA is a Census term for a metro area with a core urban area consisting of at least 50,000 residents (dark green areas of this map). In the analysis below we compare Catholics residing in a MSA as “non-rural” and those residing outside one of these as “rural.” Overall, 85% of U.S. residents live in a MSA and 15% outside of these (Census Bureau's March 2015 Current Population Survey). Looking at the Catholic population more specifically, CARA estimates that 88% live in non-rural areas (approximately 69.0 million) and 12% outside of one of these (approximately 9.6 million). This matches well with estimates from the General Social Survey (GSS). By comparison, in the early 1970s, the GSS estimates 21% of Catholics lived in small towns or rural communities. No state today has a larger Catholic rural population than Texas numbering at about 602,000, followed by Ohio with 595,000 and Wisconsin with 564,000. We have also been interested in exploring some of the “flyover state” anecdotes often used by commentators as another overlapping dimension. We compare Catholics living in coastal states with access to the Atlantic Ocean or the Pacific Ocean. Overall, 49% of U.S. residents live in a coastal state and 51% in an interior state. Catholics are more likely to live in coastal states than non-Catholics. Fifty-three percent of Catholics live in a “coastal” state (approximately 41.8 million) and 47% in a “non-coastal” state (approximately 36.8 million). These categories are not mutually exclusive. Of course one could live in a coastal state and a rural area or in a non-coastal state but also in a non-rural area. So are there any differences that emerge from these comparisons? Yes. Quite a few. A pattern emerges quickly. Catholics in coastal or non-rural (i.e., metropolitan) areas are less likely than those living elsewhere to be involved in the life of a parish. 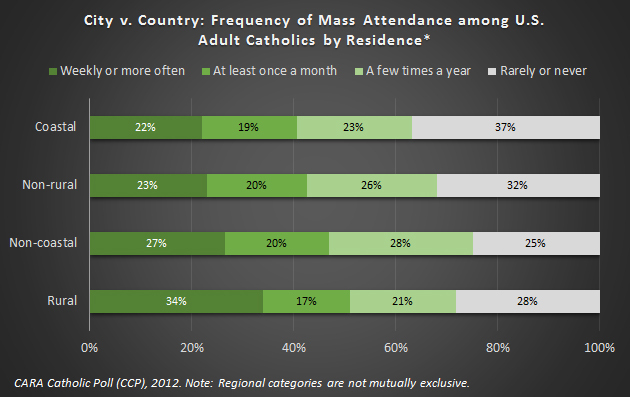 In the first figure, you can see that Catholics living in non-coastal or rural areas have more frequent Mass attendance than those living elsewhere. A majority, 51% of Catholics in rural areas attends Mass at least once a month and 47% do so in non-coastal states. By comparison only 41% of those in coastal states and 43% of those in non-rural communities attend with this frequency. Nearly 4 in 10 of those in coastal states “rarely” or “never” attends Mass. Although there is certainly no requirement than one must be registered with a parish, typically those who are are more active in parish life. It is often a prerequisite for religious education and sacramental preparation. The pattern continues here again with two-thirds of Catholics in rural communities being in a household that is registered with a parish (66%) compared to just more than half of those residing in coastal and non-rural communities (52% and 54%, respectively). Fifty-eight percent of Catholics residing in a non-coastal community are registered with their parish. Catholics in rural and non-coastal communities are also more likely than those living elsewhere to say they regularly give to the weekly collection at their parish. A minority of Catholics residing in a coastal state say they regularly give to their parish (48%). In 2013, CARA conducted a survey with an over-sample of teen-age Catholics. The results below represent the 764 Millennial Generation Catholics surveyed between the ages of 14 and 24 in that poll. The results here present another consistent rank order pattern. 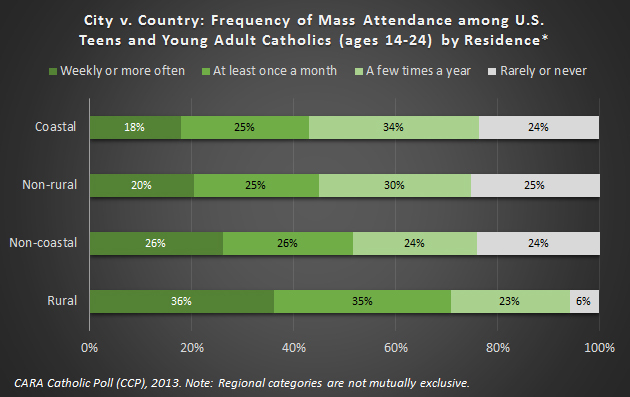 Thirty-six percent of young Catholics residing in rural areas attends Mass weekly and overall seven in ten attends at least once a month. A majority of those in non-coastal communities attends Mass at least monthly (52%). Only about one in five of those living in non-rural and coastal communities attends Mass weekly (20% and 18%, respectively) and minorities attend at least once a month (45% and 43%, respectively). It is the case that young Catholics in rural communities are less likely than those living elsewhere to ever have attended a Catholic school (K-12) or college, they are by far the most likely to have been enrolled in parish-based religious education. Only one in ten went without any formal religious education. By comparison about a quarter or more in all other areas had no formal religious education. 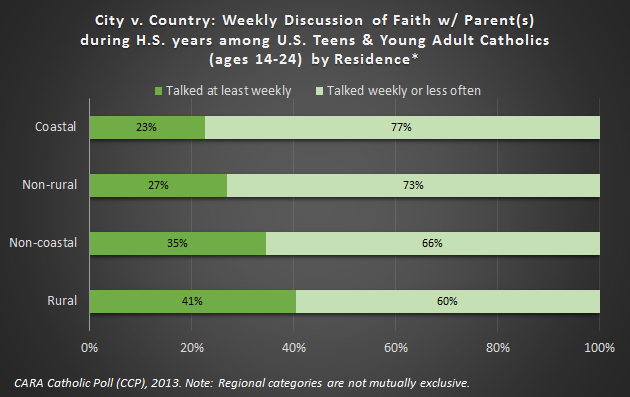 Young Catholics in rural areas are also most likely to hear about their faith at home. Four in ten say they had discussions with their parents at least weekly about their faith during their high school years. Thirty-five percent of those in non-coastal communities report this. About a quarter or fewer in other areas report this. We’ve noted before that although young adult Catholics generally have low Mass attendance rates, many continue their conversation with God through prayer. When young Catholics were asked by CARA about the importance of prayer in their lives, 86% of those in rural communities either said this was “among the most important parts” of their life (20%) or “important, but so are many other areas of my life” (66%). By comparison 70% in non-coastal communities responded a such as did 66% in non-rural communities and 65% in coastal communities. 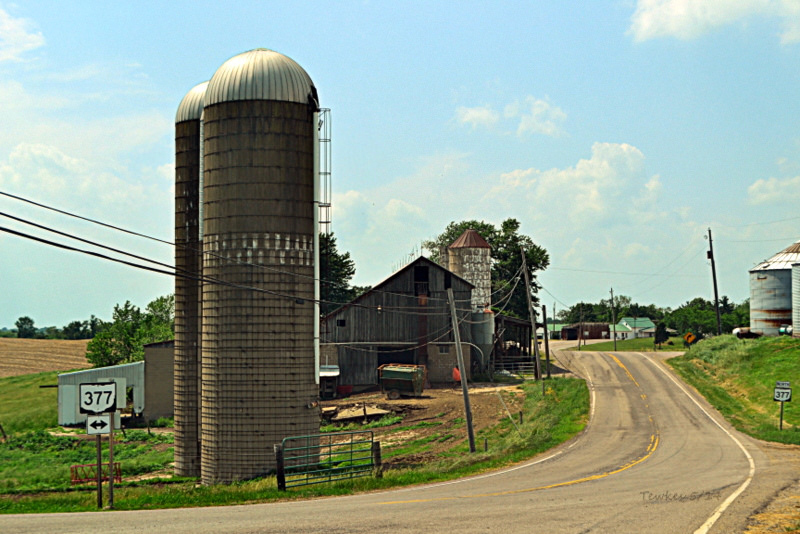 Farm and road image courtesy of Mike.